The eastern population of northern bald ibises (Geronticus eremita) has likely fallen to a single breeding bird, reports conservationists monitoring the dwindling flock. The population had believed to be obliterated starting from 1989 until a small group was discovered in 2002 in Syria. 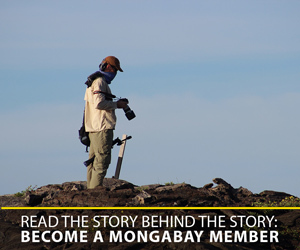 However, it now appears that this last group is vanishing one-by-one despite efforts by conservation groups to sustain the distinct population. Only one northern bald ibis has returned to the breeding site in Palmyra, Syria this season. Dubbed Zenobia, she has possibly become the population’s endling, i.e. the last of her kind. Zenobia was paired with a male, Odeinat, but his satellite tag stopped broadcasting in July of last year. The birds migrate annually from Syria to the Ethiopian highlands. Northern bald ibises in Syria do not technically represent a distinct species or subspecies according to the International Union for Conservation of Nature (IUCN). However, they are genetically different from their western cousins (found in northern Africa) and are the only members of the species to undertake long-range migrations. There is one final hope for the eastern population of this species: a semi-wild population is currently being raised in Turkey and numbers around 100 individuals. However, this group is not free-ranging and doesn’t migrate yet. In addition, if released Serra says they will not know the location of their wintering grounds since this information is believed to have been culturally transmitted from bird-to-bird. The northern bald ibis is listed as Critically Endangered by the IUCN Red List and numbers only around 500 wild birds in North Africa. 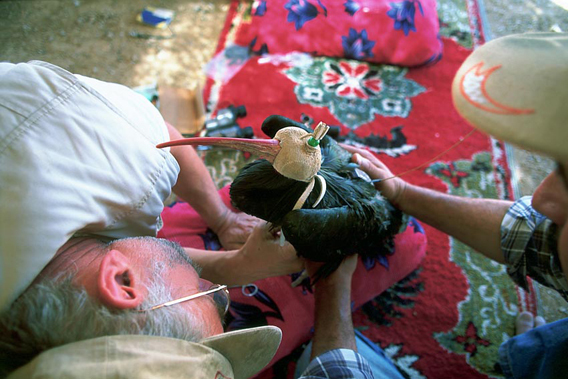 Lubomir Peske engaged in fitting a satellite tag to a northern bald ibis in Syria in spring 2006. Photo @ G. Serra. (10/31/2012) In a remote corner of the Ethiopian highlands in January 2011, the bright tropical light combined with the fresh and thin air at 3,600 metres. The Ethiopian bird-watching guide and conservationist, Yilma Dellelegn, from the Ethiopian Wildlife Society, was startled when he spotted two un-ringed young bald ibises, together with two ringed and well known adult females (Zenobia and Salam) at their wintering site. Considering the dwindling numbers, two unaccounted for young birds, literally popping out of the blue, were a great surprise—and precious! The sighting had the potential to raise intriguing geographic and behavioral questions: in fact, the riddle of the migration and wintering strategy of the oriental northern bald ibis (Geronticus eremita) was still half way from being solved. (06/11/2013) On April 21, 2013, the first flock of scarlet macaws (of many more to come) was released into the jungles of Aluxes Ecopark, nearby classified World Heritage Site Palenque National Park, as a part of a massive reintroduction project to restore the popular and culturally-significant bird to the well preserved rainforests of Palenque and the rest of its southern Mexico homeland—where the species has been extinct for close to 70 years. (06/03/2013) While many people may view zoos first and foremost as attractions, these institutions have a long history of supporting and instigating conservation work, including saving species from extinction that have vanished from their wild habitat. But such efforts require not just dedication and patience, but herculean organizational efforts. Enter, the World Association of Zoos and Aquariums (WAZA), which works with zoos and aquariums to set up conservation programs and track endangered species in captivity. (05/31/2013) The extinction of large, fruit-eating birds in fragments of Brazil’s Atlantic rainforest has caused palm trees to produce smaller seeds over the past century, impacting forest ecology, finds a study published in the journal Science. (05/28/2013) The Russian Far East is one of the wildest places on Earth: where giant tigers roam snow-covered forests and the world’s biggest owls stalk frozen rivers. Bordering northern China and North Korea, the forests of Primorye are known for the diversity of habitats, including coastal forests along the Sea of Japan, vast coniferous forests in the Sikhote-Alin mountains, and even steppe. These diverse ecosystems also makes the forests a hotspot for endangered species, including Amur tigers (Panthera tigris altaica), Blakiston’s fish owls (Bubo blakistoni), and one of the world’s rarest big cats, Amur leopards (Panthera pardus orientalis), which number only 30-50 animals. (05/22/2013) A migratory shorebird that has flown more than 400,000 miles has reappeared once again.